Browsing articles tagged with " Hendrick"
Compton, California (April 2, 2015) – Today, Transamerican Auto Parts business unit, Dealer Services International (DSI) introduced the COMMANDO™ Jeep Wrangler® concept vehicle. 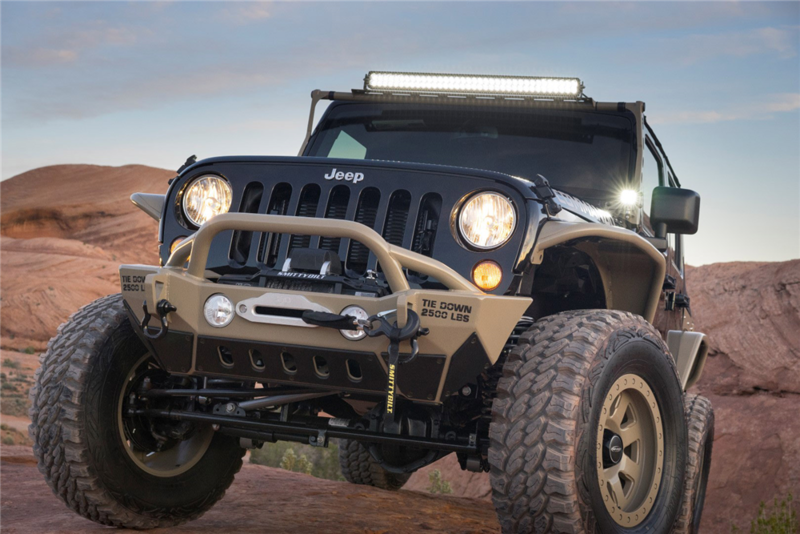 Inspired by the original Hendrick COMMANDO tactical vehicle, this dynamic on and off-road performance platform was exclusively unveiled in Moab, Utah at the 2015 Easter Jeep Safari. Exhibiting characteristics of its military contemporary, the civilian COMMANDO Jeep concept vehicle is a collaboration between DSI and Charlotte-based Hendrick Dynamics, who worked together in creating its aggressive design, styling and versatile up-fit technology; including an exact replication of the authentic COMMANDO Tan™ exterior color. “We are very excited to have partnered with Hendrick Dynamics and we believe strongly in what they are doing to help support our troops. Developing a COMMANDO Jeep concept vehicle is a real honor for our team,” said Dan Ciganovich, Director Dealer Services International. Similar to the military version, COMMANDO Jeep is one of the most capable, rugged and versatile concept vehicles ever created with its various suspension upgrades, strong but lightweight 17-inch aluminum wheels and Pro Comp Xtreme MT2 tires. The COMMANDO Jeep can go anywhere with its military-inspired steel flat fender design – for maximum tire clearance and road debris protection – and front-and-rear bumpers with a 9.5K wide-capacity winch to carry hefty loads. Additional features include a lighting package for night operations, an Armor Package for extra body protection and a COMMANDO Soft Goods package covering the seats and top. 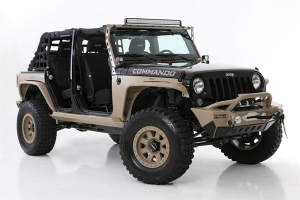 The COMMANDO Jeep concept vehicle will be auctioned later this year, with proceeds benefiting the Patriot Foundation, providing support to families of airborne and special operations soldiers killed or wounded in combat. For more information or to receive email updates about the COMMANDO Jeep concept vehicle please visit: CommandoJeep.com or call 844-458-7825. Dealer Services International is a business unit of Transamerican Auto Parts, and is the nation’s largest up-fitter of Custom Trucks and Jeeps in North America. Exclusively serving new vehicle dealerships, DSI conducts business in both the US and Canada, with over 2,000 dealer partners. Our design, engineering, and building capabilities have enabled us to provide OE quality and tested custom vehicles that are unmatched in the industry. In addition, our industry leading service and warranty programs enable the consumer to experience the same level of ownership they expect from a new vehicle. To learn more about DSI please visit www.dsicustomvehicles.com..
With its convergence of automotive expertise, advanced capabilities and high-operating tempo, Hendrick Dynamics provides vehicle solutions for the most-demanding environments – what we call Unconventional Mobility®. As problem solvers, Hendrick Dynamics utilizes advanced engineering, simulation, rapid prototyping, precision machining, quality fabrication, composite materials, safety expertise and intensive evaluation techniques to serve an array of government and commercial clients. Transamerican Auto Parts is the world’s leading manufacturer, wholesaler and retailer of aftermarket parts and accessories for trucks, Jeeps, SUVs and four-wheel drive vehicles. Transamerican operations are comprised of 69 4 Wheel Parts retail locations in North America, Transamerican Wholesale sales and distribution, Dealer Services International and the Transamerican Manufacturing Group which includes Smittybilt, Rubicon Express, G2 Axle & Gear, Pro Comp, LRG Wheels and Poison Spyder Customs. We Sell It. We Own It. We Live It. For more information about Transamerican Auto Parts, Dealer Services International and Transamerican Manufacturing Group truck and Jeep accessories.